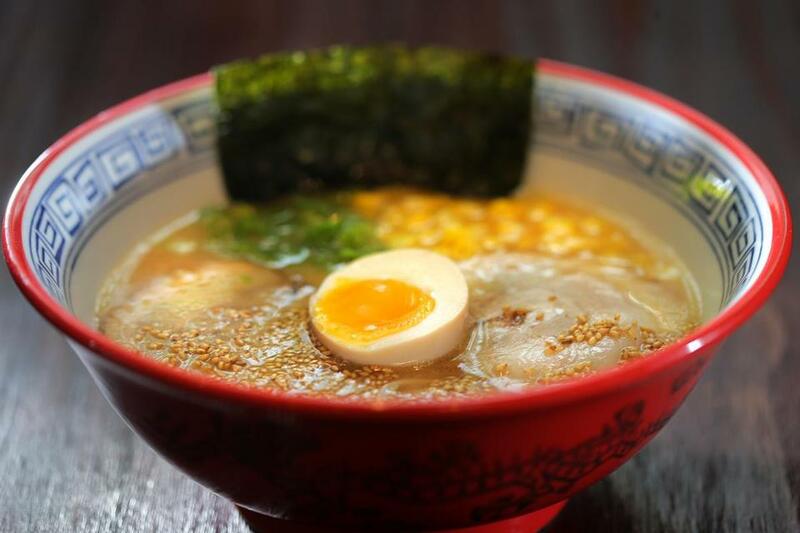 Shin Hakata Ramen making its way on Mass. Ave.
Miso ramen at Shin Hakata Ramen. At Shin Hakata Ramen, a gaggle of students is making a game of slurping their noodles. “Dude, mine was louder than yours,” one says to another. His competitor protests, but soon concedes, giving the victor a chuck on the shoulder. Tablemates laugh. The two month-old noodle joint, located north of Symphony Hall, across from the Berklee College of Music, sits on a stretch of Massachusetts Avenue that has never been much of a dining destination. The proprietors of this ramen shop hope to change that by offering a hearty style of ramen, hailing from Fukuoka, on Japan’s southern island of Kyushu. Owners Simon Su and Jing Zhang are the husband-wife team behind the restaurant. Su is also part-owner of Hakata Ramen in Quincy. The couple tacks on “shin” — which translates as “new” — to the Back Bay location’s name. (The amended name appears on the menu, but not on the sign outside.) Su lived for a dozen years in Japan, and later worked for a New Jersey-based Japanese restaurant supply business. That’s how he met chefs Eichi Sato and Mamabu Mochizuki. The two lead a kitchen team that makes noodles and broth from scratch every day. Plus, there are plenty of staff members working the sleekly renovated space. The broth in a signature bowl of tonkotsu ramen ($11.95) is sufficiently milky-looking, characteristic of its type, the result of simmering pork bones for hours. Don’t be surprised that the noodles are straight and white — these are not the yellow alkaline variety. Minced scallions and soft boiled egg complete the presentation, along with fatty slices of pork. But the dish somehow lacks meaty distinction — surprising, because “hakata” is among the richest and porkiest in the canon of ramen styles. The house broth is better with a boost. A spicy tonkotsu ramen ($12.95) adds chile oil to the mix, resulting in a pretty vermilion-hued soup with bright, spicy flavors to match. Similarly, miso ramen ($13.95), garnished with corn, toasted sesame seeds, and more pork, offers comforting depth of flavor. Serving sizes are modest, so get a few sides for the table. A couple of those starters need work. Crab salad ($7.95) is not the lump meat variety. This is imitation crustacean — the kind you find tucked inside any supermarket California roll. (The revised menu now lists the seafood as “crab sticks,” a more accurate descriptor.) Tako wasabi ($6.95) arrives as wan tidbits of long-marinated raw octopus, sulking beneath overdressed mesclun greens. A manager takes both dishes off our bill. For now, a straightforward favorite like the pork gyoza ($4.95) is a better option. On one visit, a server is so glum he’s almost surly. “Did he just Frisbee that plate onto the table?” asks a dining companion as he strides away. Later, he plunks down a can of green tea, without offering a glass of ice or a straw. We hope this is an anomaly. On other occasions, servers check in frequently to refill our water glasses and make sure we like what we’ve ordered. Unexpectedly delightful is tomato soup ramen ($13.95), which turns out to offer one of the nicest vegetarian broths around. Offering a hint of creaminess without dairy, it cradles perfectly cooked noodles. Sadly, the bowl arrives with a garnish of rubbery avocado, plus tomatoes so pale you would think it’s the middle of New England winter. Why not just leave these off if the fruits aren’t ripe? Takoyaki ($5.95) shows that the kitchen can be attentive to detail. Ignore the “grilled pancake balls” description. These are croquettes — lightly crisp on the outside, with minced grilled octopus and a dab of cream sauce inside. The piping hot morsels are drizzled with ribbons of mayo, and topped with miniature flakes of bonito that wave cheerfully in the appetizer’s wafting heat. More dishes should rise to the occasion like this one does. Fingers crossed that the team will work out the kinks, and win the loyalty of students and ramen aficionados alike. Major credit cards accepted. Wheelchair accessible. Prices Appetizers $4.95-$8.95. Ramen noodles $11.95-$13.95. Rice bowls $10.95-$12.95. What to order Miso ramen, spicy tonkotsu ramen, tomato soup ramen.